We have a wide variety of special parts to make your lamp beautiful, including old style rayon cords with acorn plugs, solid brass and antique brass finish parts, cast brass dimmer sockets, and more. We also perform basic socket and cord replacement if you just need the simplest of repairs. A lamp repair specialist is available to talk with you Monday thru Saturday, 10:00am to 5:00pm. 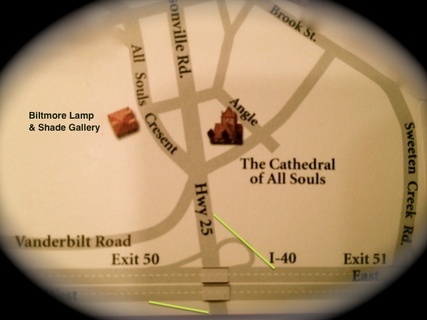 Bring your lamp to Biltmore Lamp & Shade Gallery for a lamp repair. We can also make a lamp from your vase or other item. We can make custom bases for you too! A lamp repair specialist is on hand 10:00am - 5:00pm Monday through Saturday. If your lamp is too heavy for you to carry inside, come on in and tell us; we'll be happy to carry it in for you! Friendly, attentive service is what you can expect at Biltmore Lamp & Shade Gallery!